Downtown Carson is perfectly framed among the trees in this view from the Capitol plaza. 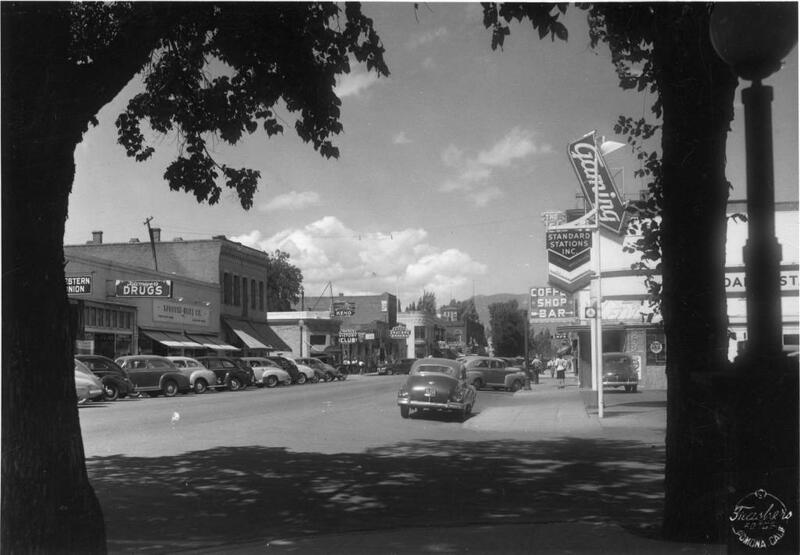 This photo looks north across Musser Street in the 1940s. On the left you can see Western Union, Kitzmeyer Drugs, Sprouse-Reitz, Eagle Market, and further down the street Tommy's Victory Club, a grocery, the Arlington Hotel, and the cupola of the U.S. Mint barely peeking over everything. 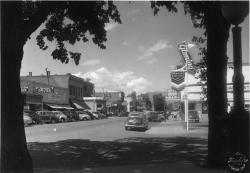 On the right side of the street is a Standard gas station, and behind that the Senator Cafe. Down the street the sign for the Pine Cone Cafe can be barely seen.